Kids will be soaked in the sound world the moment he or she puts it on. 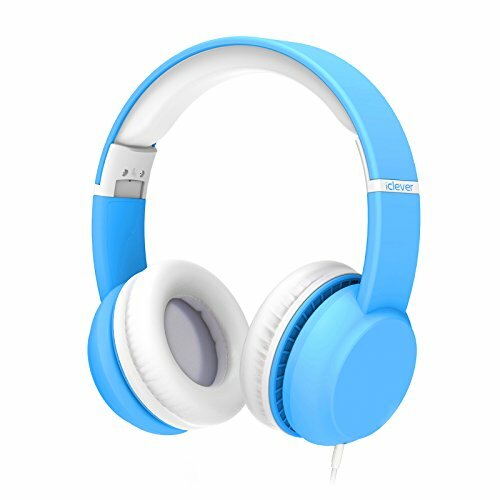 iClever kids headphone is also limited by sound-control circuitry to produce a sound that is no more than 94dB in volume to avoid hearing loss or damage. Beyond the volume, the sound is listened to on a padded headband and soft on-ear cushions that are well-sized for little ears. Pillow-soft earmuffs, thicken covered headband and swiveling ear cups not only make it more durable and comfortable, but also let you absorb in high-quality feast after long time listening without interruption. What’s more, the earmuffs are made of memory-protein material. With all careful designs, just enjoy your sound trip. Each headphone is equipped with two AUX ports and packed with two pieces of wires (One with microphone). Your kids could connect either of it with another headphone to share music or audio with his or her intimate friend. The other wire is engineered with microphone. Our headphone wires are made of premium nylon fabric. The shining features of this material are that it won’t knot in a mess and it is sturdy enough to withstand certain extent of pulling, dragging and rubbing. Trust us, iClever kids headphones are of high quality and superior design in all aspects. The adjustable headband saves a lot space for your go-out plan with your child. Its compact, portable design makes it an ideal companion for anything from a luxury hotel stay to a weeklong hiking trip. We also decrease the weight in some extent. A light weight neckband design conforms to the body for wearability. It works with virtually all smartphones, pc, tablets with the standard 3.5mm AUX. Please take off your headphone every 2 - 3 hrs to relax your ears and keep your head comfortable. FOLDABLE DESIGN & WIDE COMPATIABILITY: iClever wired headphones combine foldable design with a mighty punch, delivering great audio quality for such a convenient device. With smaller size, you just drag it into the bag and take it out for different sound options when your kids feel boring. It is compatible with all the smartphones with 3.5mm aux, like iPhone, Android, laptops and so on. Please feel free to reach our customer service. You are entitled to enjoy 45 Days Money Back Guarantee, 18 Months Replacement Warranty. View More In Over-Ear Headphones. If you have any questions about this product by iClever, contact us by completing and submitting the form below. If you are looking for a specif part number, please include it with your message.